Based on reviews from 1,450 users. 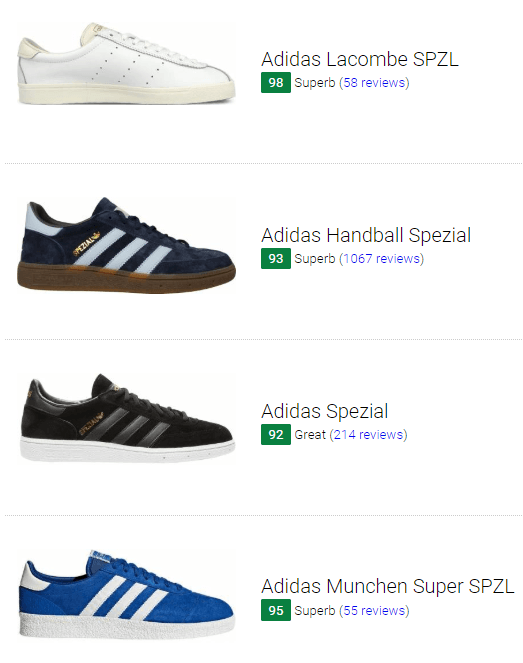 Learn how our rankings work or see our guide to Adidas Spezial sneakers. Updated Apr 2019. Adidas has produced a lot of iconic kicks since its inception in 1949 in the Bavarian town of Herzogenaurach, Germany. Founder Adolf Dassler made sure that the brand was at the forefront of footwear innovation, producing kicks for different sports. The brand also has its share of legendary lifestyle kicks, such as the Superstar and Stan Smith, along with collaborations with such names as Pharrell Williams and Kanye West. These sneakers have lived up to the hype, yet there is one line from the brand that has thrived well under the radar: the Adidas Spezial Collection. 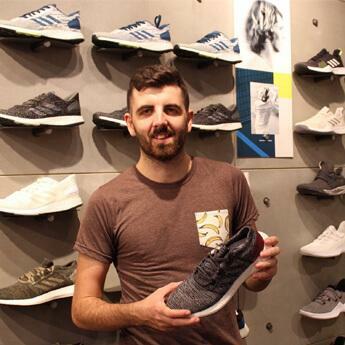 Long-time Adidas fanatic Gary Aspden from the United Kingdom curated the Spezial series under Adidas Originals, gaining popularity in 2014. The whole line is based on vintage shoes from the Adidas archive, especially in relation to the British casual scene as well as the football subculture of the 1970s and 1980s. Adidas Spezial sneakers have taken inspiration from the past, drawing on archived and vintage models to produce a fresh new shoe. The kicks are also inspired by different sports, from running and training to tennis and football. For the first Adidas Spezial model, the game of handball was the inspiration. Fans who are invested in the depth and breadth of Adidas history should find the Spezial line to be interesting. The collection not only revisits retro models but also provides comfort and style without all the fuss. Various colorways such as white, black, red, and blue along with other combinations are offered for different style preferences. The series only goes to prove that sporty and casual can mix well together. Below is a list of the most popular Adidas Spezial footwear, grouped according to what their primary inspiration was. This shoe was inspired by a vintage model from Aspden’s personal collection. It is his tribute to the legendary football manager and player Bill Shankly, who was best known for managing the Liverpool Football Club. Aspden took a little-known sneaker and made it into something modern yet retro. It has a deconstructed upper made up of textile, suede, and mesh, complete with signature Adidas branding. The name comes from Bill Shankly’s Scottish hometown. These Adidas Spezial shoes are averagely priced at $130. Men’s sizes can be found, ranging from 4-13. It fits true to size but several users have revealed that it runs narrow. As such, they have advised others to go one size up for a proper fit. The 1985 Marathon running sneaker inspired the Lowertree SPZL. As a result, these Adidas Originals Spezial shoes have a distinct throwback appeal, brought on by the mixture of bright colors and a fresh perspective. The running-inspired profile is done in suede and mesh, showcasing a pastel color combination consisting of white, purple, and blue. A "heel scoop" is incorporated into the midsole, just like the original Adidas Marathon shoe. These Adidas Spezial sneakers were affordably priced at $110. Men’s 4-13 are offered for this model. More than a handful of buyers found the shoe to be small, suggesting that getting a half size up would be best. 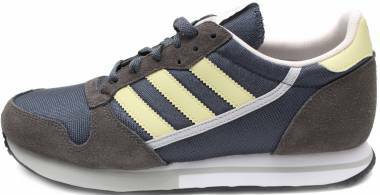 Often confused to be the Adidas Gazelle, the Adidas ZX 280 SPZL features a similar look with a suede upper. It also has a minimalistic approach, along with its premium cushioning, gum outsole, and reinforced heel. Additionally, the sneaker took inspiration from the Madchester model, which was essential party footwear during the late 1980s. These Spezial shoes from Adidas have a sock liner that offers a boost of comfort for wearing. It has a slightly expensive price of $130. Sizes are in men’s 5-12, but women can go also acquire a pair by going down by 1.5 in the sizing. According to the reviews, the sneaker runs small. This sneaker takes after the original Columbia shoe when it comes to the design, which is the reason why so many fans went for this model. It was released over three decades after the original during the 2018 Spezial Spring/Summer Collection. The offerings for the season took inspiration from the 1980s British music scene, in particular, the Acid House subgenre. The plugs on the midsole offer various cushioning densities. A soft thickness is delivered by the white-colored one, the red plug provides the medium, and the navy one is for the hardest. It retailed at a slightly expensive $150 price tag. These Adidas Spezial shoes are in men’s 4-12 sizes, which buyers have described to run large. They are also suitable for women if they go down by one size. The Adidas Lacombe SPZL is named after the maiden name of the mother of a Spezial team member. It was introduced as part of the brand’s 2016 Spring/Summer collection. For its inspiration, the shoe takes after the Newcombe shoe from the early 1970s, named after tennis champion John Newcombe. It featured a distinct and rare stitch design on the toe, among many other unique accents. Soft leather lines the sneaker, containing the print “350” in tribute to the original model. These Adidas Spezial shoes for men are reasonably priced at $110. Its sizes are in men’s 4-12.5. Several purchasers have commented that it runs large. In Fashion Week 2018, Adidas released the Acid Winter Special Collection, featuring such shoes like the Adidas Munchen Super SPZL. This model was the update to the 1970s Munchen shoe from the Adidas City Series, which was named after Munich, Germany. The indoor-training footwear was upgraded with this version, which featured a retro appeal that many collectors and fans loved. Blue and green are among the striking colorways of this sneaker. Singer Liam Gallagher was seen wearing a pair of these kicks before they were released, declaring these as his favorite Spezial edition yet. At $110, this men’s Adidas Spezial model delivers value for the money. Although this model only comes in men’s 4-11 sizes, women can still get their pair by going 1.5 sizes down. It has a general true-to-size fit. The Mallison SPZL was inspired by the Adidas AS 700, which was released in the 1980s, mostly in some European countries and in Japan. This updated edition’s name came from Mark Allison, the Airdrie fundraiser who worked to raise money and awareness for the Pancreatic Society of Scotland. Classic details from the AS 700 remain, while the shape and colorways were tweaked. The outsole of these Adidas Spezial sneakers has a Trefoil logo pattern for a vintage touch. It’s a reasonably priced offering at $110. This shoe is said to fit as expected. Men’s sizes from 5-13 can be found. Released in 2017, the Adidas Super Tobacco SPZL is an iconic iteration of the Super shoe from the Spezial line. A tonal wood-like hue is seen all over the model, right down to the laces and the sole. It took inspiration from the Adidas Freizeit series from the 1970s, which was a fashion line geared towards the holidays. Additionally, its outsole is inspired by the Adidas Bermuda. This sneaker is a budget-friendly option from the series, with a price tag of $90. In general, this model fits true to size, with sizes ranging from men’s 3 up to 15. One of the shoes released in the Fall Spezial collection in 2017 was the Adidas Winterhill SPZL, which was meant to be the successor to the Adidas Mounfield SPZL. Its name comes from Winter Hill, a hill which overlooked Aspden’s hometown. German mountaineer Reinhold Messner’s signature high-top hiking boot inspired these Adidas Originals Spezial shoes. The suede upper is treated with a water-repellent finish. With its price point of $180, this sneaker is expensive. With a true-to-size feel, this shoe is found in men’s 4-13. Women’s sizes for these Adidas Spezial shoes are not available, but they could go down by 1.5 sizes. The Adidas Padiham SPZL was part of the 2018 Spezial collection, which was inspired by the late 1980s parties in the White Isle, Ibiza. Graphic designs and bright colors were used to reflect the lively scenery. For this model, Aspden and his team took inspiration from the Adidas Samba, the iconic football sneaker. The shoe is named after a British town that used to hold electronic music festivals in the 1980s. This sneaker has a pigskin suede upper. It comes with extra laces that feature the vintage lace wrap design of the Spezial range. At a $110 price tag, this shoe is in the affordable range. These Adidas Spezial shoes are in men’s sizes, ranging from 4-12 with a true-to-size fit. Women can choose to go 1.5 sizes down. Two years after the Adidas Spezial series was introduced, a Spezial version of the legendary Samba sneaker was released. The Adidas Samba SPZL incorporates a luxe full-grain leather upper as well as suede overlays along the eyelets and toe cap. This version also features the Samba’s molded tongue design, in addition to the rubber toe cap and pivot-pointed rubber outsole. Actor Ewan McGregor was seen wearing these men’s Adidas Spezial kicks in the 1996 film Trainspotting. He was also spotted wearing the shoes off-screen. It comes at a slightly expensive $125 price tag. Men’s 5-11.5 sizes are offered. It fits according to size. The Intack SPZL was released in 2017 along with four other models. Its minimalistic and sporty look was highly reminiscent of the 1970s and 1980s kicks. An unreleased Adidas Gaucho shoe inspired these Adidas Spezial sneakers. Contrasting side stripes and heel accents along with a premium leather upper elevate these kicks to retro elegance. 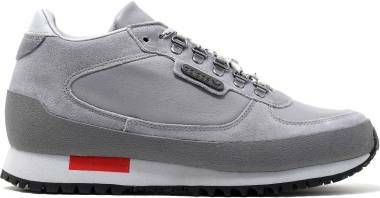 This shoe has a thinner outsole than the original Gaucho sneaker, inspired by the Adidas Bermuda model. At $110, these kicks are reasonably priced. These men’s Adidas Spezial shoes are found in men’s 7-13. Generally, the shoe fits as expected. Exuding a timeless dapper appeal, the Adidas McCarten SPZL was made to follow in the footsteps of the Adidas Albrecht SPZL. It is named after Bobby McCarten, a good friend of Aspden's, who is also a die-hard Adidas collector. Its classic finish and minimalistic vibe balance the shoe's retro looks. Leather makes up the upper of these 1970s-inspired, stylishly classy sneakers, which were made for leisure activities. It’s an averagely priced shoe with a price point of $130. Some reviewers have found that these kicks run small. Men’s sizes from 4-12.5 were released. Gary Aspden created the Adidas Originals Spezial series with this silhouette, which has been around since the 1970s. He and Adidas then reintroduced it with a suede upper and a gum sole. It was first introduced in the colorways red/white, white/blue, and white/black. Since then, many editions of the sneaker have been released, proving the model’s timeless appeal across the years. This shoe was inspired by the footwear used in the fast-paced sport of handball. It has a four-zone construction that is meant to improve the wearer’s speed. At $75, this sneaker is budget-friendly. A few wearers have revealed that the model runs narrow. Men’s sizes from 6-14 are available. Women’s sizes in these Adidas Spezial shoes are not offered, but they could go 1.5 sizes down. A stylish and vintage design inspired the Adidas GT Wensley SPZL, enhanced by the premium materials used on the shoe. Leather along with nylon material graces the upper, resulting in a classic and minimalistic sneaker. It’s a worthy update the original Adidas Wensley SPZL, this time made with a more durable and more comfortable structure. Grey and beige are the colorways offered for these kicks. It’s affordably priced at $120. These men’s Adidas Spezial shoes fit true to size. Men’s 7-13 were issued for the sizes. 1. Where to buy Adidas Spezial shoes online? Adidas Spezial kicks, just like many of the brand’s shoes, are sold at its many stores worldwide. They are also available online at the Adidas website. Similarly, brick-and-mortar footwear chains and department stores carry the brand’s sneakers. Spezial footwear could also be found at different online stores and reseller sites. 2. What is the aesthetic of the Adidas Spezial collection? The Adidas Spezial collection consists of shoes that are inspired by different vintage kicks, resulting in a distinct retro appeal. Gray Aspden created the Adidas Originals Spezial line with a clear vision in mind: it was to be a low-key counterpart to the hyped-up scene of footwear. As such, the Adidas Spezial series sits outside the radar for the most part, geared towards avid Adidas collectors and fans. 3. How could one clean Adidas Spezial kicks? Adidas Spezial shoes could be cleaned using the methods laid out by Adidas. It’s important to note that the brand’s kicks should never put into the washing machine, as the washing process could prove to be too harsh for the material. As such, the sneaker could lose its shape or color. Below are the tips that Adidas has outlined for the proper cleaning of footwear. To shake off loose dirt and pebbles, knock the soles together. Create a mixture of mild, eco-friendly detergent and warm water. Use a piece of cloth to dab the mixture on the stains on the sneaker. To rinse off excess soap, use a washcloth dipped in warm water and apply it gently on the material. Adidas Spezial kicks should strictly be air dried at normal room temperature. Dirty laces can be washed in a bowl of soap and water mixture. Take out removable insoles and dry them out overnight. A sprinkling of baking soda should be able to eliminate odors if there are still some that remain after drying out. Lastly, apply leather polish on the upper of leather to keep them shiny and protected. 4. What are the materials used on Adidas Spezial footwear? Suede and leather are the common materials used for the upper of Adidas Spezial models. Other materials include nylon, mesh, and textile. Rubber is usually used for the outsole, while EVA material is commonly incorporated on the midsole. 5. What is the fit and size range of Adidas Spezial models? Shoes in the Spezial series are mostly released in men’s sizes, ranging from 4-13. Although there are rarely any Adidas Spezial sneakers in women’s sizes, they could also wear the kicks by going down by 1.5 in the men’s sizing. The fit depends on the material used on the shoe as well as the design itself, although the kicks fit true to size in general. Some have been found to have a narrow or small sizing, while others run large or wide. If this is the case, then reviewers would advise others to go up or down by a half size or more. 6. Where are Adidas Spezial sneakers made? Adidas shoes, including the Spezial collection, are produced in the company's many factories around the world. There are more than a thousand factories that produce Adidas kicks, many of them located in Asia. The brand constantly releases an updated list of these establishments, naming factories in such countries as India, China, Thailand, Indonesia, Vietnam, Turkey, and more. 7. What to wear with Adidas Spezial shoes? Shoes in the Adidas Spezial collection are deemed to be very versatile due to their retro roots and sporty appeal. As such, there are many ways to dress them for different occasions, especially for casual everyday wear. The following are some tips on how to wear Spezial kicks. Adidas Spezial shoes for men can be mixed and matched with shorts, pants, chinos, jeans, and more. They could be paired with t-shirts and a jacket, hoodie or sweatshirt. Sporty outfits consisting of joggers, track pants, and t-shirts would complete the sneakers’ throwback flair. Ladies can dress down the shoes with jeans or shorts for any day or dress them up with a skirt or dress for any function. Athleisure pieces such as leggings, joggers, tank tops and more would also go well with the models’ sporty touch. 8. Are there any innovations used on Adidas Spezial kicks? Due to their retro inspirations, Adidas Spezial sneakers don’t feature the latest technological advancements that Adidas is known for. However, the kicks emphasize comfort by providing the best essential elements, such as a Spezial sock liner and pivot points on the outsole. The line focuses on tried-and-tested features for fit and comfort instead of pushing the boundaries for footwear tech. Additionally, the main attraction of the series is its retro-inspired flair, ideal for those who are looking for vintage looks balanced with unfussy features. 9. What are some methods for taking care of Adidas Spezial footwear? Like many Adidas shoes, Spezial models have to be cared for so that they will last longer. Aside from regular cleaning, which is recommended as soon as the shoe gets dirty, the sneakers also have to be stored properly so that they will keep their shape and look. Here are some more tips. Use a shoe tree to keep the shape of the sneaker. This is readily available at many shoe stores or online. Keep leather shoes looking new by polishing them regularly and applying leather polish. Suede kicks should also be brushed regularly so that they will keep their color and texture. Air out Adidas Spezial shoes first before putting them inside the closet to quickly get rid of accumulated odors. Lastly, make sure to wear pairs of shoes alternately. Wearing one pair every day will cause the kicks to develop wear and tear more quickly. 10. What is the price range of shoes in the Adidas Spezial collection? The Adidas Spezial collection offers budget-friendly models starting at $75 up to $90. Reasonably priced kicks could also be found at a range of $110-$120. Slightly expensive shoes come with a price tag of $125 up to $150. Lastly, Adidas Spezial kicks such as the Winterhill SPZL come with an expensive price point of $180.